In version 1.4 and earlier of the SDF spec, the <pose> element represents a relative coordinate transformation between a frame and its parent. Link frames were always defined relative to a model frame and joint frames relative to their child link frames. In version 1.5 of the SDF spec, the frame attribute string was added to <pose> elements to allow poses to be defined relative to a named frame instead of the default frames from version 1.4. For example, this would allow an SDF model to define its kinematics like a URDF, with joint frames defined relative to the parent link frame and a joint's child link frames relative to the joint frame. The 1.5 specification also adds <frame> elements which can define named coordinate frames in addition to the existing link and joint frames in the model. This document is a work in progress to define the semantics of the pose frame attribute. In sdf 1.4, sibling elements of the same type must have unique names. For example, the following models are invalid because links, joints, and collisions with the same parent do not have unique names. The following model contains collision elements with the same name, but the models are valid because the elements are not siblings, but rather children of different links. Sibling elements of different types are not mandated to have unique names, so the following is valid, though it is confusing and not recommended. It is allowed to create a link named world, but there is special treatment for a joint with world specified in the <parent> or <child> tags, so it is not recommended to do so. With the exception of joint frames, all <pose> tags in sdf 1.4 define a relative transform between the current element's frame and the frame of its parent xml element. For example, in the following model, the link frame is defined relative to the model frame, and the inertial, collision, visual, and sensor frames are all defined relative to the link frame. The one exception is the joint frame, which is defined relative to the child link frame. In the following example, the joint frame is defined relative to the link frame of link2. For comparison, the behavior of parent frames in Unified Robot Description Format (URDF) is given in this section. A URDF files contains links, joints, collisions, visuals, and inertials like SDFormat, but with several significant differences. The first difference is that coordinate transformations are expressed using the attributes of the <origin/> tag instead of the value of <pose/>, which is a superficial difference as the numerical contents of each tag have a similar definition. The most significant difference between URDF and SDFormat coordinate frames is related to links and joints. While SDFormat allows kinematic loops with the topology of a directed graph, URDF kinematics must have the topology of a directed tree, with each link being the child of at most one joint. URDF coordinate frames are defined recursively based on this tree structure, with each joint's <origin/> tag defining the coordinate transformation from the parent link frame to the child link frame. This model in this image could be represented by the following URDF with model frame M, link1 frame L1, link2 frame L2, joint1 frame J1, etc. using the suffix notation for kinematic quantities described in the specify_pose tutorial. For comparison, here is an SDFormat model with the same link names, joint names, frame names, and parent-child relationships. The definition of SDF coordinate frames is illustrated by the following image, in which all links are defined relative to the model, and each joint is defined relative to its child link. Since there is no offset allowed between the child link frame and the joint frame in URDF, the SDF joint poses are all zeros. Once pose frame semantics are implemented in SDFormat, it will be possible to define an SDFormat model that behaves identically to a URDF model by specifying the parent reference frames according to the URDF convention. Joints specify the parent and child links by name in the <parent> and <child> elements. 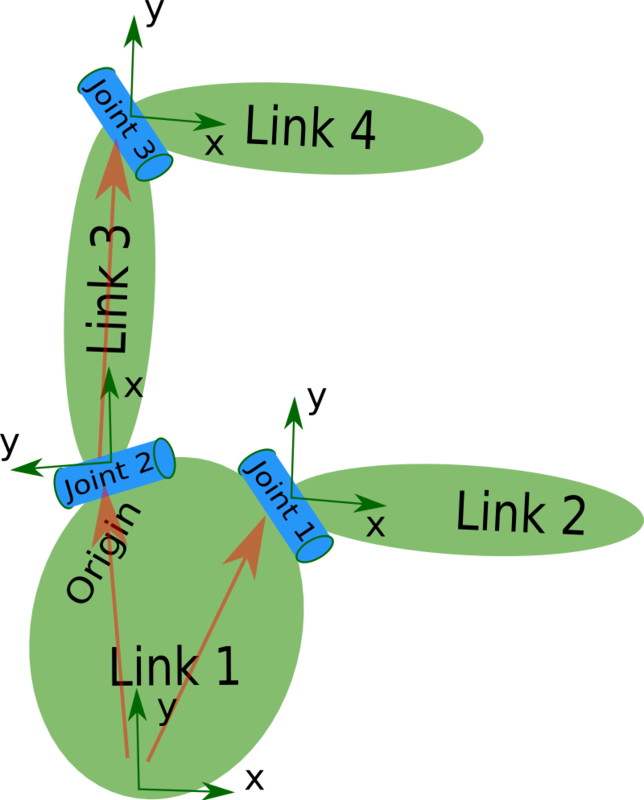 The specified links must exist as siblings of the joint with one exception: if one but not both of the parent and child links is specified as world and a sibling link named world does not exist, the world link will be interpreted as a fixed inertial frame. The following model contains joint with a valid specification of sibling links. The following models contain joints with a valid specification of one sibling link connected to a fixed inertial frame as parent or child. The following model contains a link named world, so the joint connects link to its sibling rather than connecting to a fixed inertial frame. The following model contains an invalid joint specification because the parent link does not exist. The following world also contains an invalid joint specification because, while link1 does exist in the world, it is not a sibling of the joint. This section has discussed naming conventions for <joint> elements as children of a <model>. For completeness, it should be noted that the SDF specification allows for a <joint> to be a direct child of a <world> (see world.sdf:58), but the naming conventions for this case are not established, as this use case is not supported by Gazebo or any other known software. Support for nested models was added in sdf 1.5, which allows a <model> element to contain child <model>s. For example, the following model contains two links nested inside child models. The coordinate frame of each child model is defined relative to its parent element, following the convention from sdf 1.4. A joint can specify the names of parent and child links from sibling models by specifying the sibling model name with the delimiter :: followed by the link name. This model contains a valid joint specification with a child sibling link and the parent link from a sibling model. Please note: The future nesting behavior, the naming rules for child models (can they have same name as the parent model? ), and the :: delimiter are under discussion and subject to change.